Chateau Dalem vineyard overlooks the Isle Valley and is located very close to Libourne city, in the municipality of Saillan. The estate started operating in the wine industry in 1610 and has since remained in the same family for over three centuries. In 1955, Michel Rullier took over the 10-hectare vineyard planted with 90% Merlot and 10% Cabernet Franc in the Fronsac appellation. 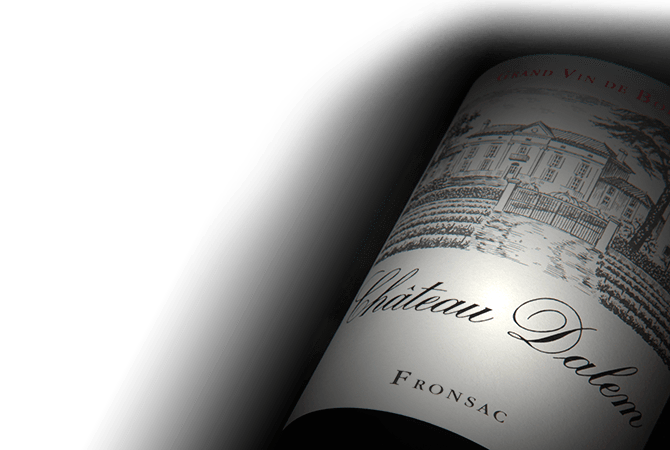 The wines famous strong character and elegance is drawn from distinctive, damp soils: limestone-clay profile dominated by the famous Molasse du fronsadais (Fronsac molass) over a limestone base. In 2002, Michel’s daughter, Brigitte Rullier, took over the business and brought a feminine touch to the wines while preserving their “quiet force.” Chateau Dalem Fronsac wines are filled with character, elegance, and finesse.